Is it enough that we know how to basically operate computers? What if it breaks or some software malfunctioned? Do we always have to rely on others to fix our computers? Don’t you think it’s better if we know something about how to fix our computers even the very basic for us not to be taken for granted by other technicians? So here we go again, trying to find a solution about some basics in our lives and that can only be solved by figuring out what to know or what to learn about this particular issue. We give you: Computer Hardware NC II, offered by TESDA, established to teach us how to diagnose and troubleshoot software and hardware problems in our computer. Let’s be honest, admit it or not, most of us know how to operate or use computer, whether it’s basic or intermediate, but only few are wise in using it. Therefore, in order for us to improve our skills in operating computers, we must learn this variety of stuffs so that we can save efforts, time and money. This computer related short course contains lessons about troubleshooting, options we may use to repair the systems of our computer and other skills that we may acquire once we enroll in this program. 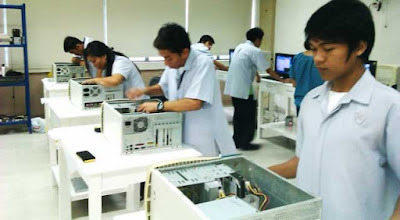 There are actually plenty of other competencies offered by this course namely: Performing computer operations; Performing mensuration and calculation; Preparing and interpreting technical drawings; Using hand tools; Terminating and connecting electrical wiring and circuits; Installing computer systems and networks; and Maintaining computer systems and networks. These are actually but a few examples of other competencies we may learn. Others can be inquired if you desire so. The goodness of this course is that; it only takes 320 hours to complete. Then you may be able to apply as a Computer Technician or Computer Repairman. Requirements, on the other hand, vary based on the type of course you are going to take. Although, fixed requirements still need to be submitted. These requirements are your Birth Certificate authenticated by NSO, Your High School or College Diploma, Your transcript of records or Form 137, Your Certification of Good Moral Character, and lastly, Your 1x1 or 2x2 Pictures. It is best not to forget these as these are the core requirements in enrolling. Upon finishing this course, you will be required to take a Competency Assessment before graduation to ensure the issuance of the National Certificate (NC II). Questions and inquiries will be entertained if you visit the this site, or o directly to the nearest TESDA institution in your area.